Cascade Aquatic Herbicide has revolutionized submerged weed control in irrigation canals throughout the Western United States providing 12-16 weeks of control with a single application. Cascade Aquatic Herbicide has revolutionized submerged weed control in irrigation canals throughout the Western United States. Cascade provides control of sago pondweed, horned pondweed, watermilfoil and other troublesome weeds found in irrigation canals; providing 12-16 weeks of control with a single application. A single injection site can provide weed control for an entire irrigation canal system. At rates of 2-4 ppm injected for 12-24 hours requires only 1.8-3.6 gal. per CFS. 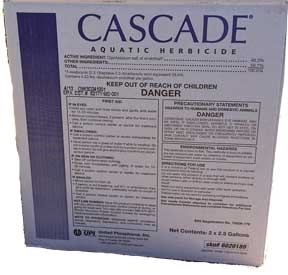 Cascade is easy on the environment and is non-toxic to fish and wildlife when used according to the label.